Therapist Supportive Workshop for students III | Urfa, Turkey – DOZ e. V.
Within the psychological rehabilitation project which was launched by the Union of Kurdish Students in Syria and Germany in both Suruj and Urfa cities – Turkey in order to support and rehabilitate those students who were captured in the late fifth month of 2014 by ISIS. Session III of rehabilitation has taken place in the Turkish city Urfa on 12.12.2014 with the presence of 10 students, the session has inaugurated with a welcome speech for the students by the colleague Ahmed Shekho, director of the Union in Kobani branch, he also talked about the prepared program within this workshop and discussions that will be held within this session. The first part of the session began by talking about the role of education and its importance for each student, their family and the community. Furthermore; he expressed during his speech about the mechanism by which a student can exploit under these circumstances in the country to be an essential step for them toward future. Some of students interrupted the session by saying that : they are done with the time of education and study and now it is the time to work and earn money; at this point the colleague Ahmed answered the students by explaining that the person who doesn’t fulfill his/her study and doesn’t seek to get his/her undergraduate degree is like a hopeless person. Through discussions among students and between each of the two colleagues Dilbirin and Ahmed, they were able to clarify the purpose of the education, and they reached to the point that everything in this life is important not just studying and that there are basics and topics, each one is more important than the other and education is considered one of the key pillars to achieve success even at work. The other part of the meeting was taken up by the colleague Dilbirin , he addressed the students about the sequence of events that they came across during the period of their capture, including the points that if some of them had the courage to think about escaping, despite their knowledge of their farness from their areas and it may be cost them their lives just to think about the idea of escaping, many of them talked about the schemes exerted against them from the moment they came out of Aleppo heading to return to their homes in Kobani. Moreover, they expressed numerous complaints to the local community, for not giving any consideration to them, especially in terms of confidence because they were captured for a period of time by ISIS. 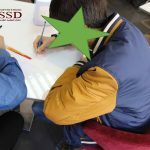 The colleague Dibirin has sorted the students into several groups and provided each one of them with papers and pens to express and exchange their ideas to prove to them how affective teamwork is comparing with single work. 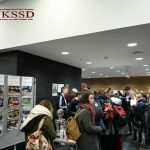 Many discussions and talks united between students and UKSSD’s team on many topics. Moeover, they hope that the local community could help them and support them after what they experienced and passed through due to their capture by ISIS. In conclusion, the colleague Ahmad Shekho presented his thanks and gratitude to the students, stressing on the determination of the UKSSD to provide all what it has to service the civil society especially students.